Forget the stress of everyday life in our spa hotel in the Zillertal and enter into a fantastic world of water, warmth, gentle fragrances and exquisite essences. Surrounded by the impressive mountain panorama, relax and unwind in our spa area. Bubbly whirlpools, a heated outdoor pool, different saunas, cuddly relaxation areas and precious treatments await you. Year-ound you can engage in many activities during your wellness holidays in Tirol. Our fitness and yoga coaches offer a unique programme of easy sports, outdoor activities and relaxation. In the summer months, we also offer a guided hiking programme. In our wellness hotel in the Zillertal you can immerse yourself in refreshing water. Our indoor swimming pool has 72m² and features a cascading waterfall, sparkling fountains and invigorating massage jets and is perfect for a leisurely swim or just floating. Our hotel also has an outdoor pool heated to 30°C which is connected to our indoor pool. The architecture is inspired by oriental elements. After a refreshing bathing experience, relax in cosy loungers or enjoy lying outdoors on our 1,000m² sunbathing lawn under shady trees. 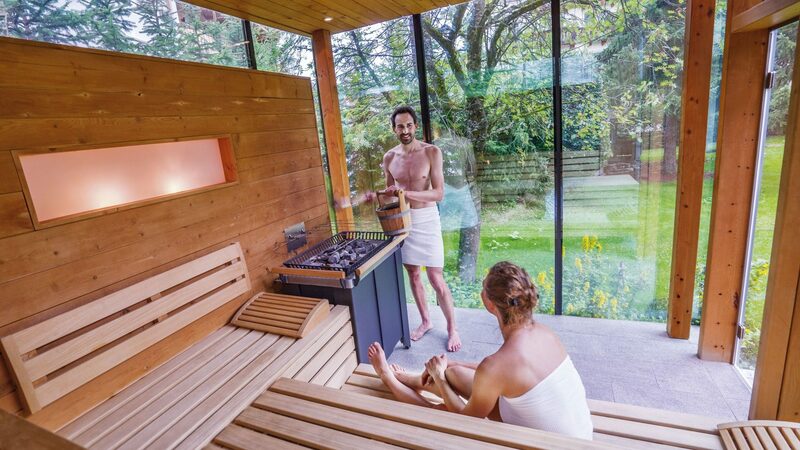 A visit to our sauna area makes your spa holidays in Gerlos perfect. Those who prefer soft sauna bathing can try the bio sauna with 50°C or the Roman steam bath with 48°C. We also offer a separate family and textile sauna in the swimming pool area. Sauna enthusiasts will enjoy the Finnish sauna (92°C) and the panorama sauna with a fantastic view of the surrounding mountains. Refreshing cold water basins, an infrared cabin and solariums round off the sauna experience in our spa hotel in the Zillertal. The biggest polarities in life are “fire and water” and all traditional healing methods agree on this. The fire blazes fiercely and has the power to heat water. Water, on the other hand, is slower and more stable, maintains its calmness and is able to break every stone, to put out every fire. We have dedicated ourselves to fire and water and harmony, which is created by the balance of body, mind and soul as soon as these two forces come into balance. Our SPA treatments are designed to give you this feeling of well-being. Put yourself in the hands of our experienced staff or enjoy the pools, saunas, steam baths and relaxation rooms.